The Four-in-Hand is considered the most versatile tie knot. 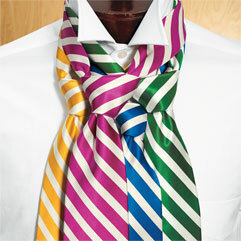 Acceptable when used with any type collar, but best suited for a straight, tab or button down. Use the simple instructions below to tie a Four-in-Hand knot. Start with the wide end of the tie on your right, extended about 12 inches below narrow end. Cross the wide end over the narrow, then again under the narrow. The Windsor is a big and chunky tie knot. Larger than the Half Windsor. Best when used with a wide spread collar shirt, perfect for a Windsor Spread or English Spread collar. Use the simple instructions below to tie a Windsor knot. The Half Windsor is a solid, balanced tie knot. Slightly smaller than the Windsor. Best when used with a spread collar shirt, perfect for a Windsor Spread or Park Avenue Spread collar. Use the simple instructions below to tie a Half Windsor knot. What Tie Knot is Right for Me? The Windsor is a big and chunky tie knot. Best when used with a wide spread collar shirt, perfect for a Windsor Spread or English Spread collar. View our post How to Tie a Tie: Windsor Knot.